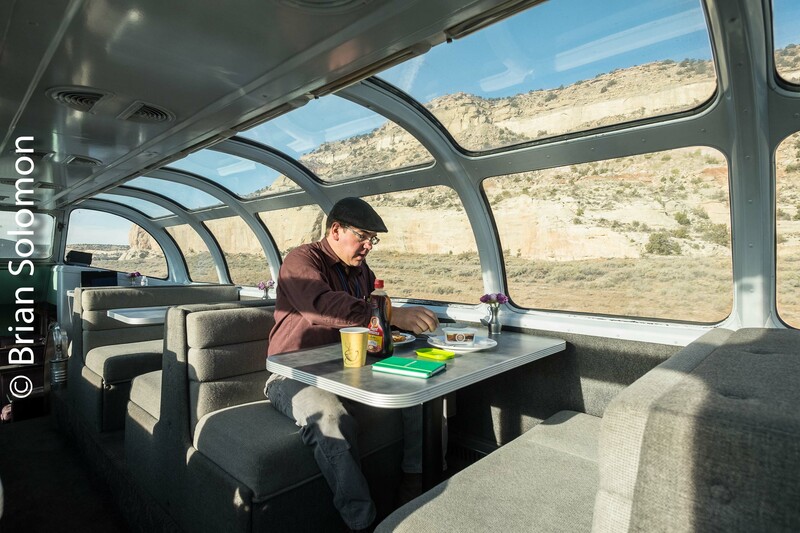 New Mexico Revisited: Soaking in BNSF’s Transcon on the Move. It had been more than 20 years since my last visit to New Mexico. This was my first by rail. 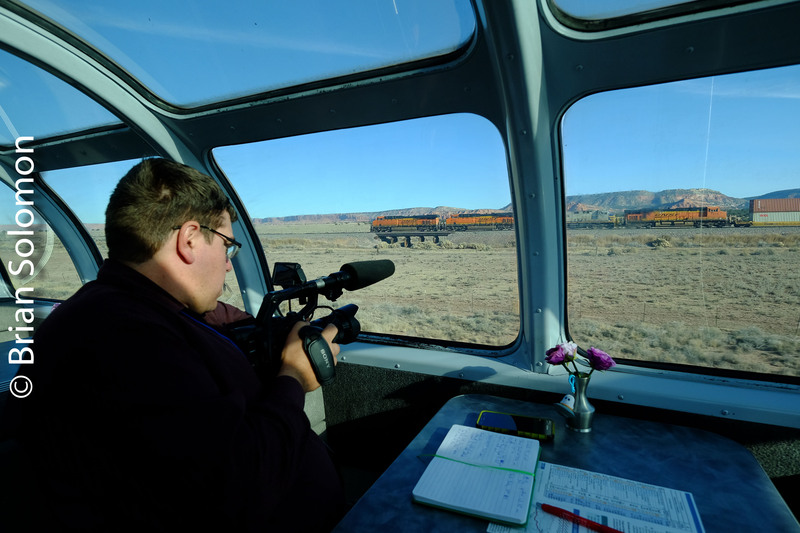 I was on my way east with Dave and Rhonda Swirk and Derek Palmieri of New Hampshire’s Conway Scenic Railroad, documenting Budd Vista-Dome Silver Splendor on its journey from Los Angeles to its new home in New Hampshire’s White Mountains. 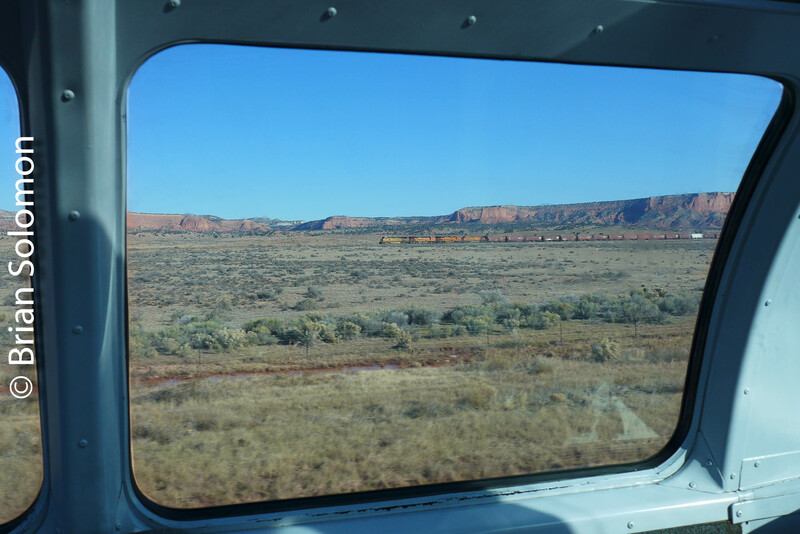 As we glided east at the head-end of Amtrak number 4 theSouthwest Chief,we met or overtook dozens of freights, many of them intermodal trains, on BNSF’s former Santa Fe Transcon. Wow, BNSF sure runs a lot of freight! 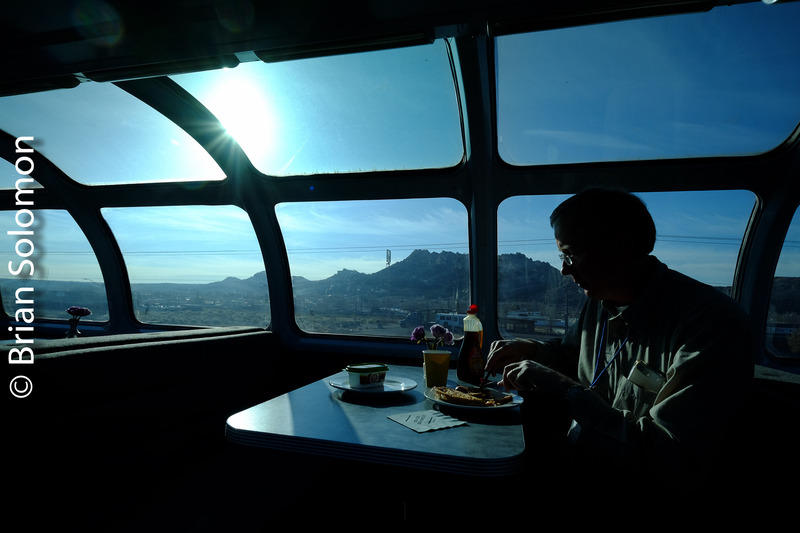 Dave Swirk enjoys breakfast near Gallup, New Mexico. Exposed using a FujiFIlm XT1. View from Silver Splendor near the Arizona-New Mexico state line. BNSF westward freight near the Gallup, NM station .FujiFilm XT1. BNSF eastward freight as seen east of Gallup. Lumix LX7 photo. 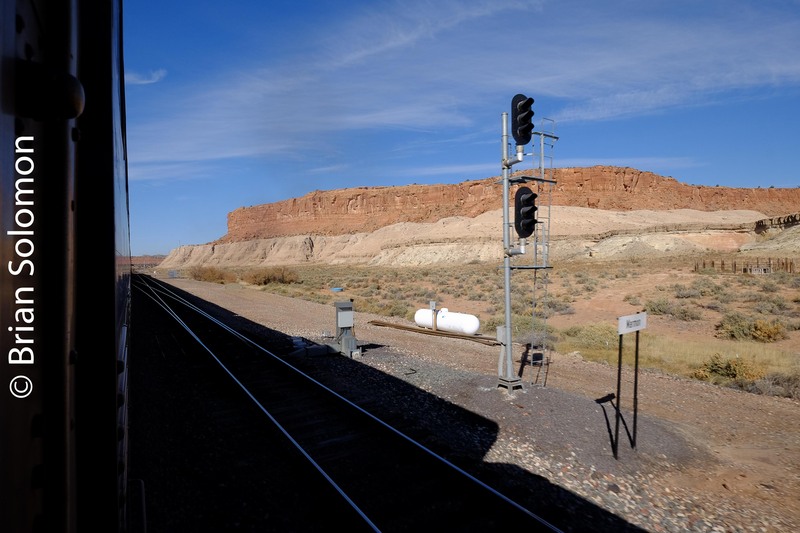 BNSF’s former Santa Fe has several long sections of split alignments, where mainline tracks are not adjacent. 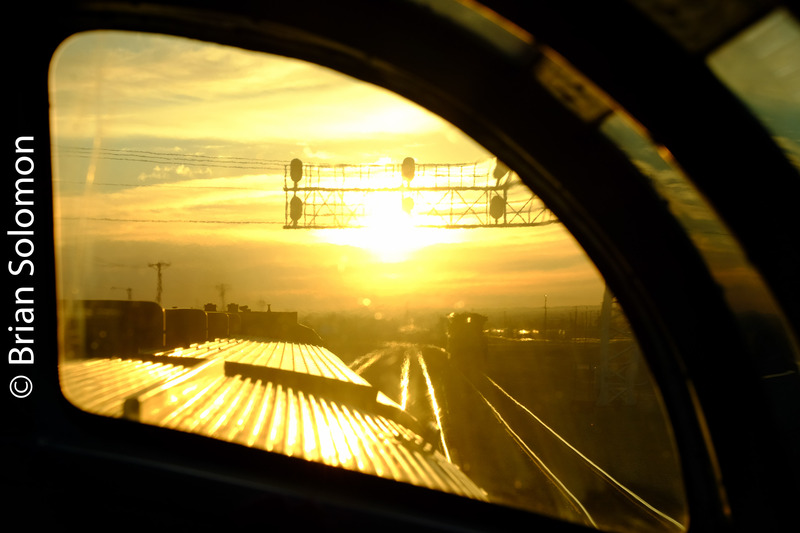 A westward freight can be seen off in the distance to the north of Amtrak No. 4. Lumix LX7 photo. BNSF westward intermodal freight. FujiFilm XT1 photo. Amtrak No.4 paused at Marmon, NM for traffic to clear. FujiFilm XT1 photo. I exposed these photos digitally using my Lumix LX7 and FujiFilm XT1. 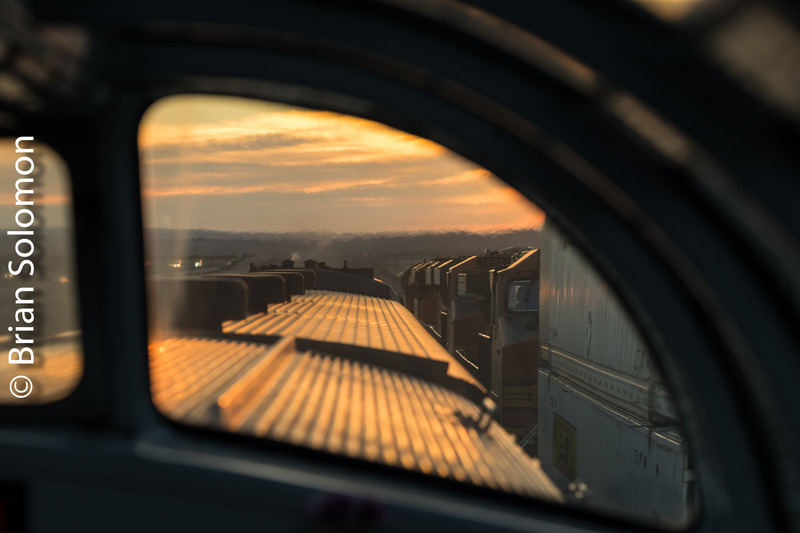 Part of the challenge of making photos of trains from the train is trying to compose while in motion of moving subjects. Not only does this make if difficult to level the camera, but it leads to motion blur and other potential defects. 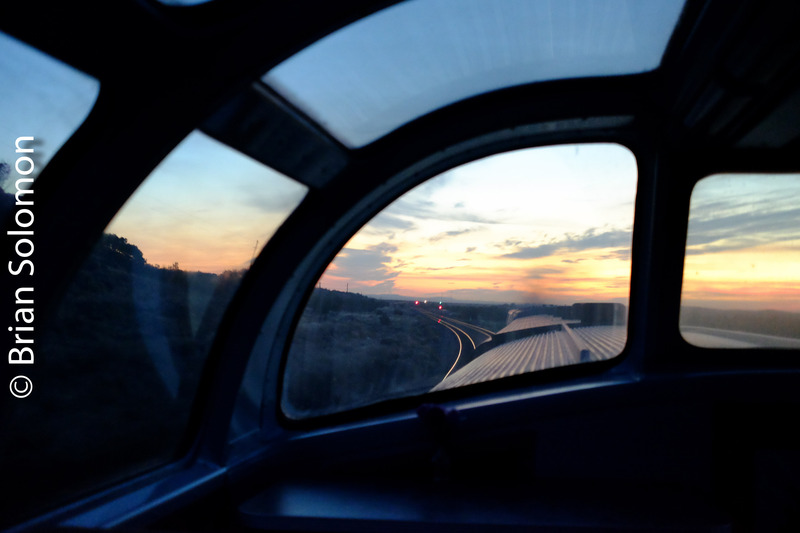 ‘Santa Fe All the Way!’ Arizona Sunrise Rolling East on the BNSF Transcon. 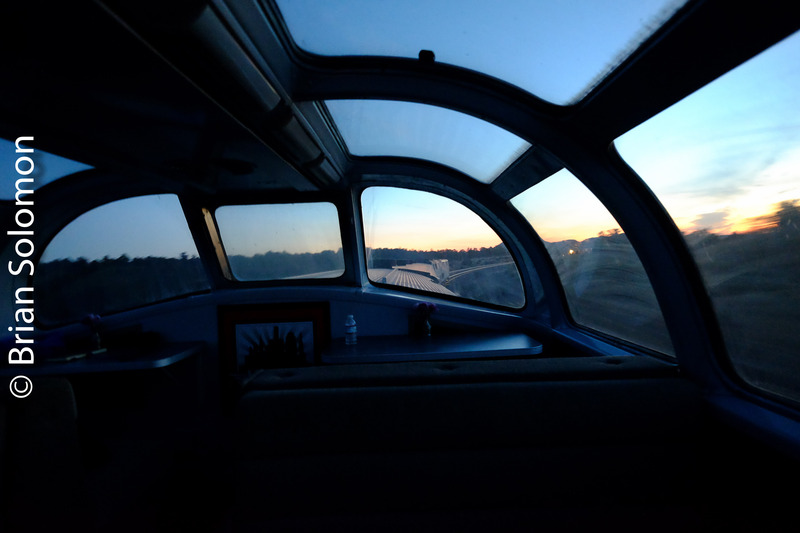 Last week, I awoke to sunrise east of Flagstaff, Arizona riding in Budd Vista Dome Silver Splendor as it traveled east on Amtrak no.4, the Southwest Chief. The luxurious 1956-built stainless steel dome is a classic car from America’s streamlined era. It was on its way to a new home on the East coast after years being based in California. 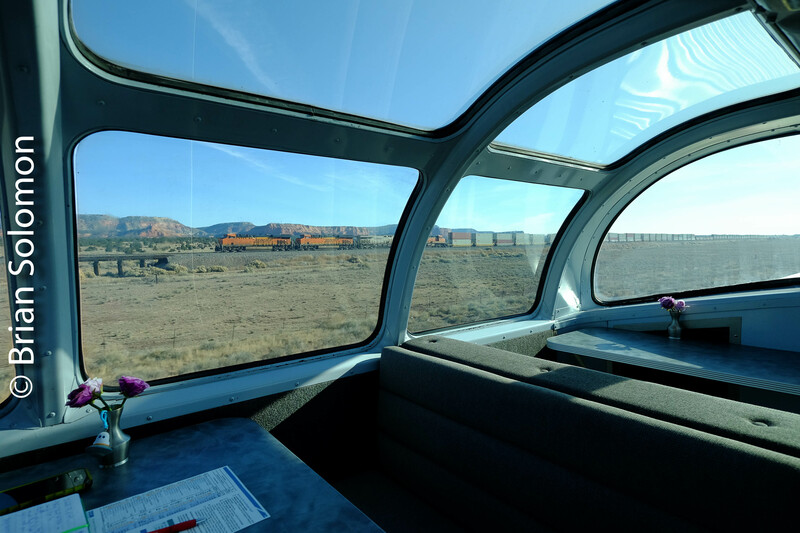 The pleasure of traveling in a Vista Dome is enjoying its comfortable elevated panoramic view of the passing scenery. 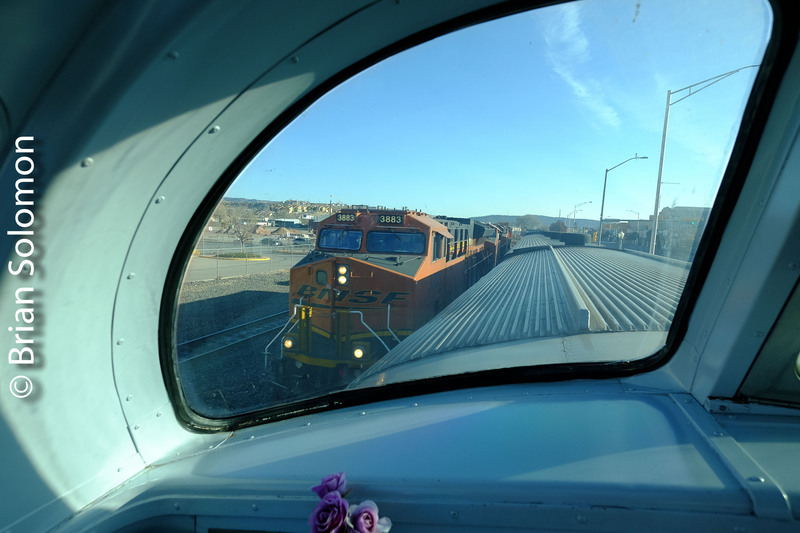 An added bonus on BNSF’s former Santa Fe Transcon is the unceasing parade of freights. Sunrise on the Santa Fe east of Flagstaff, Arizona on November 18, 2018. Notice the headlight of an approaching BNSF freight. Sunrise on the Santa Fe east of Flagstaff, Arizona on November 18, 2018. 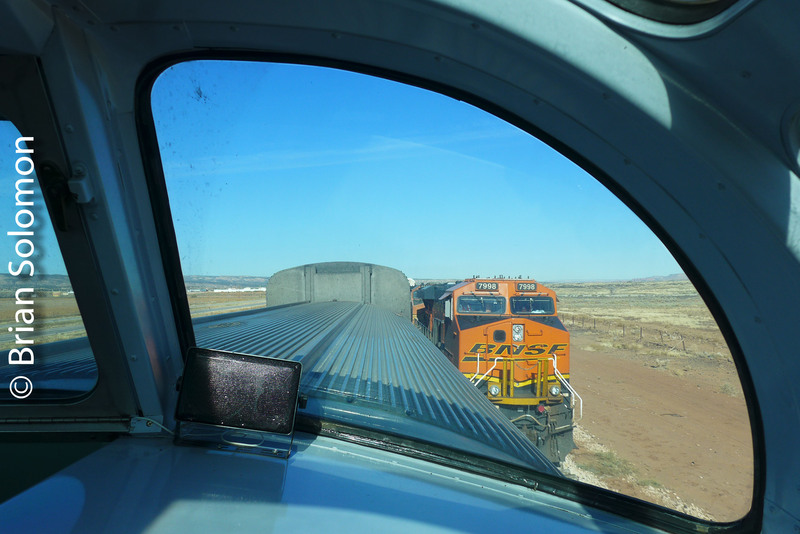 Overtaking an eastward BNSF freight east of Dennison, Arizona. 90mm view. Rolling east at Winslow, Arizona. 90mm view from Silver Splendor. These images were exposed digitally using my FujiFilm X-T1. Some of the photos were adjusted in post processing to compensate for the dome’s tinted glass. 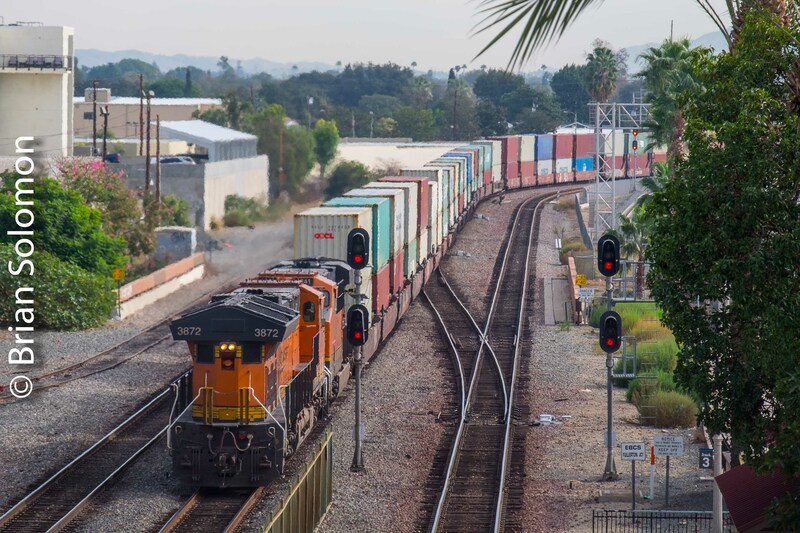 BNSF Stack Train at Fullerton, California—November 2018. The triple-track mainline at Fullerton, California is a great place to watch and photograph trains. 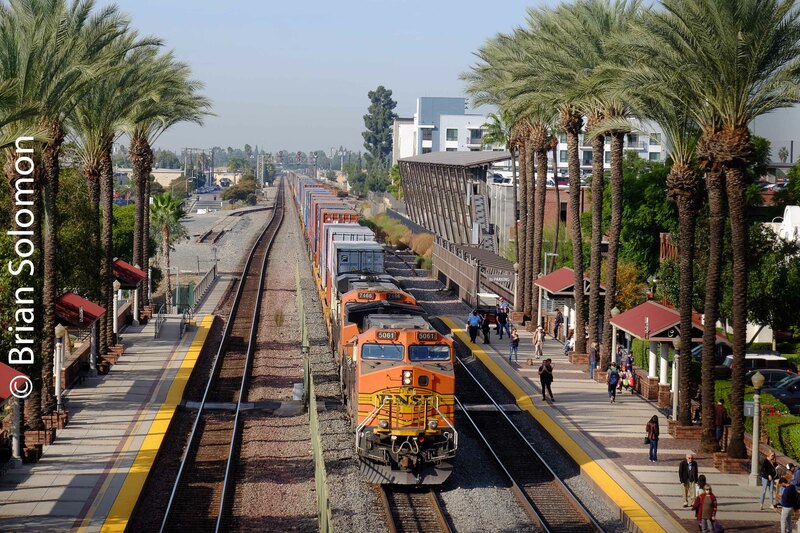 In addition to a steady procession of transcontinental container traffic, Amtrak and Metrolink passenger trains operate over the line and make stops at the old Santa Fe station. 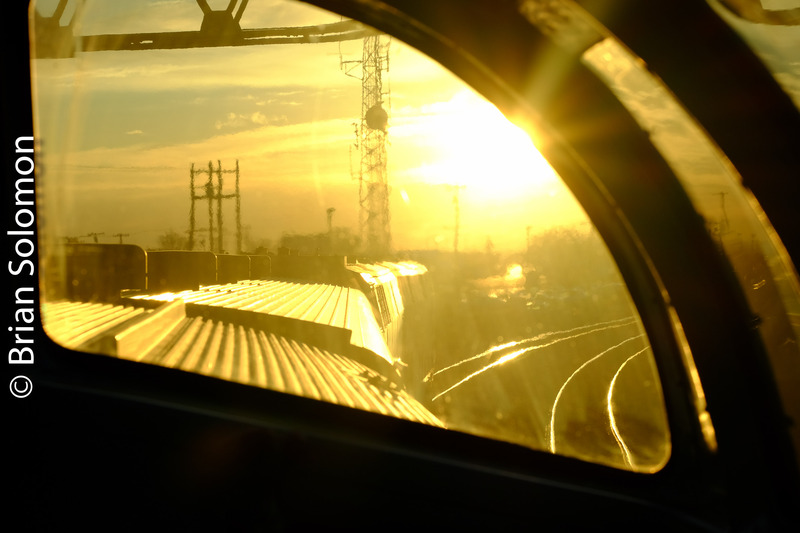 Centralized Traffic Control with bi-directional signaling on all three lines allows dispatchers flexibility to route trains in either direction over any mainline track. There are crossovers immediately east of the station platforms. The challenge of photographing from the pedestrian bridge is navigating the wire mesh. While my Lumix LX7 with its small diameter lens did a better job of getting through the fence, I opted for my Fuji camera because I wanted a longer telephoto lens to bring in the stack train which had stopped on the middle line waiting for a signal. 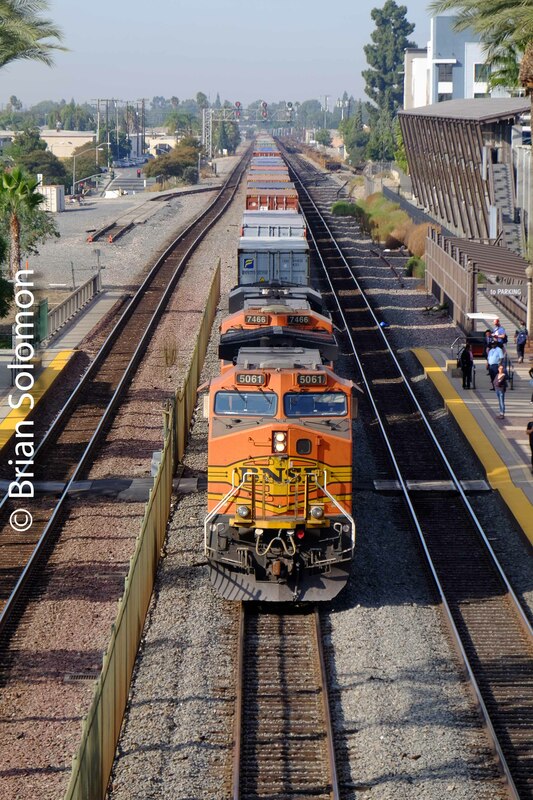 BNSF Stack Train at Fullerton, California. I made this view on Friday November 16, 2018 using my FujiFilm XT1 with a 18-135mm Fujinon zoom lens. I made this view on Friday November 16, 2018 using my FujiFilm XT1 with a 18-135mm Fujinon zoom lens. Trailing view of the eastward double stack at Fullerton featuring locomotives working remotely as ‘Distributed power’ at the back of the train.